Louis XV owned both cats and dogs. He was attracted by cats at an early age. 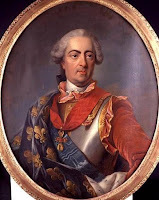 The Marquis de Calvière, a royal page, recalled that, at the age of twelve, Louis possessed a female cat called Charlotte who had a litter of four kittens. The young king handled them so much that three out of four died within twenty-four hours. 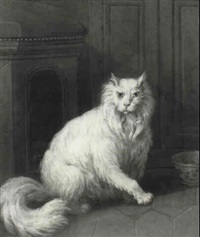 As an adult, Louis had a particular affection for angora cat called Brillant, who would come to wake him every morning. This cat habitually sat on the mantlepiece during Royal Council sessions in the cabinet du Conseil , which was one of the most luxurious rooms in Versailles. Saint-Simon spoke of Brillant as the King's "colleague". 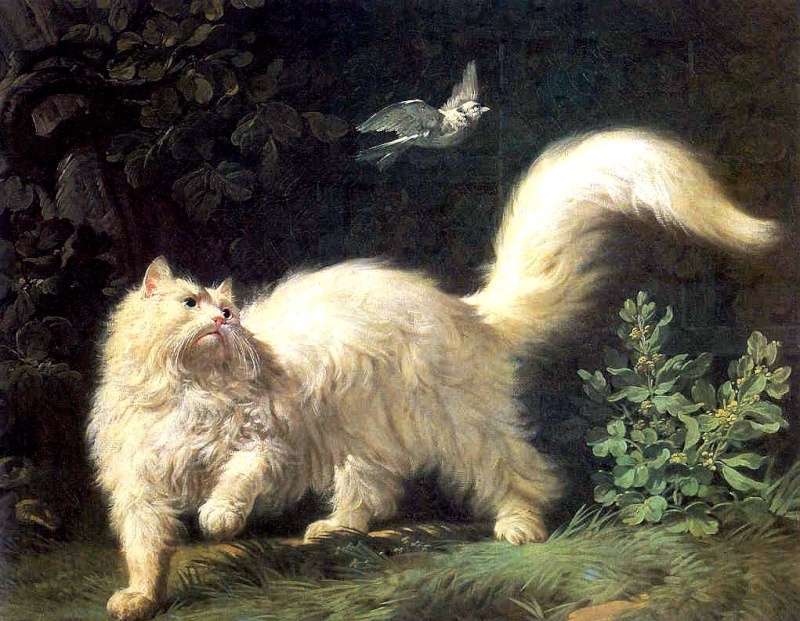 The cat was the particular charge of Louis Quentin, the marquis de Champcenetz, Louis's premier valet de chambre. In this anecdote, recounted in the memoirs of Jean-Nicolas Dufort de Cheverny, the royal pages, with Champcenetz as their ringleader, managed to incur the displeasure of the usually easy-going Louis by tormenting his favourite cat. The king had a white angora tomcat, of prodigious fatness, very gentle and very friendly; he used to sleep in the cabinet du Conseil on a cushion of crimson damas in the middle of the mantlepiece. The King always returned to the petits appartements at half-past-midnight. It was not yet midnight, and Champcenetz said to us, "Did you know that I can make a cat dance for minutes on end?" We laughed and laid bets. Champcenetz then pulled out a flask from his pocket, stroked the cat and poured eau de mille fleurs all over its paws. The cat went back to sleep and we thought that we had won our bet. But suddenly feeling the effect of the esprit-de-vin, it jumped to the ground, emitting explosive noises; it ran across the King's table, growling, staggering and making balletic leaps. We were all laughing, when the King suddenly appeared out of nowhere; everyone resumed his position, his proper demeanour and serious expression. The King asked what had amused us. "Nothing, Sire, we were just telling a funny story," said Champcenetz. At that moment the wretched cat recommenced its dancing, running around like a madman. The King watched it: "Gentlemen, he said, what is going on here? Champcenetz, what have you done to my cat? I want to know". The question was direct; Champcenetz hesitated for a moment then recounted briefly what had happened, whilst the cat continued its dance moves. He told the tale smiling, watching the King's eyes to see how he would take it; but the King scowled. "Gentlemen, he said, I will take this no further; but if you wish to amuse yourselves in future, I trust that it will not be at the expense of my cat". This was said so dryly that no-one after that ever tried to make the cat dance. It happened only that once. while women outweigh men as "cat-lovers", it's amazing how many men have owned a cat which they see as friend and companion. In these cases, it is usually a male cat who has this special friendship with the man who owns that cat. Louis XV was a case of this. C,S. Lewis wrote a novel, "The Horse and his Boy:, there is such a thing as a Cat with his Man.